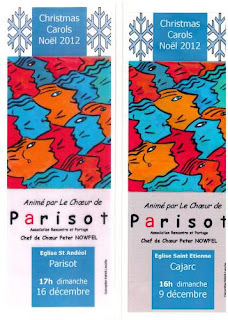 lf you are anywhere near the Tarn-et-Garonne this Sunday, you must attend the choral concert at the church in Parisot. This group of 50 voices accompanied by an instrumental ensemble entertained us in Cajarc this past Sunday, and they were magnificent! With audience participation, they sang many traditional carols in English, French and Dutch. Lessons were read in those languages as well. Interspersed between lessons and carols were some fabulous pieces of classical sacred music. As a former church choir member, I can attest to the fact that this music is not simple and takes hours of practice to get it right. The chorale group is made up strictly of folks who love to sing and volunteer their time to put together these concerts. Under the direction of a professional musician and conductor, Peter Nowfel, the choir did not disappoint, and we all left the church feeling warmed by their voices and imbued with the Christmas spirit. Our carol service is tonight and for us it really marks the start of Christmas. Enjoy yours on Sunday! 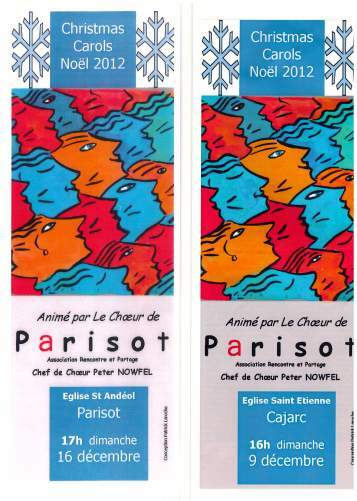 I was there on Sunday and it was superb, they are a great choir and I hope they come to Cajarc every year from now on. Thanks for publicising it for us, Evelyn! We are hoping for a full church on Sunday. We got more than a full church last Sunday (16th) at Parisot. In fact, people were standing in the aisles, behind the altar, on the steps to the lectern, anywhere there was a space. Thanks so much again for publicising it for us. Maybe we'll be back at Cajarc next year.